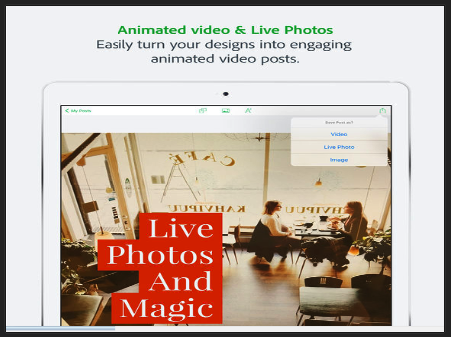 You can use Adobe Spark Post to create visuals for all sorts of occasions including social posts on social media websites, inspirational quotes, announcements, invitations, presentations, photo captions and many more. 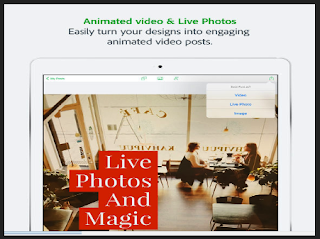 Some of the interesting features the app provides include: the ability to design your own visuals and share them as videos or live photos, access to a set of beautiful text fonts, shapes and typography, access to a huge library of free premium photos, save your projects so you can come back to them and tweak and reuse them with new photo and text, share your creations via social media websites such as Instagram, Facebook, Twitter or via email , text message or save it to your Camera Roll. You can also export your visuals in high resolution format.